"Should I buy non-remy hair weave?" Much like the question about whether to buy remy hair weave extensions, the short answer is if you feel comfortable wearing non-remy weave hair, then yes you should. Now we that a whole bunch of folks will be ready to click the little cross to close this browser window, but before you do, just take a minute to find out why non-remy hair is not the big bad hair monster it's made out to be. To remy or not to remy? This is a common question and so we'll mosey through the merits of non-remy weave hair and leave the frequently espoused merits of remy weave hair to another article. Remy hair has all cuticles intact and running in the same downward direction which means remy hair tangles in the exact same way that growth hair tangles. Remy hair is not tangle-free hair: it can tangle and it does tangle just like growth hair tangles. It might be more helpful to think of remy hair as having a normal hair tangling rate; it isn't tangle-free. 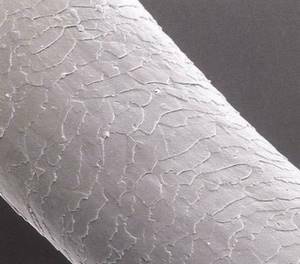 All of the strands of hair have cuticles, but the cuticles point in both directions (some upwards and some downwards). "Which Kind of Non-Remy Hair Weave Tangles?" If the Non-remy hair has cuticles (which are pointing up and down - root to tip and tip to root) it has a proclivity to tangle more often than remy hair as the cuticles on strands pointing upwards catch on the cuticles of strands pointing downwards. A significant amount of human hair products on the market are made with non-remy hair and part of the human hair marketplace includes the selling of unprocessed non-remy hair that companies buy with the aim of removing the cuticles and then processing for texture and colour. "How do you care for non-remy hair weave?" 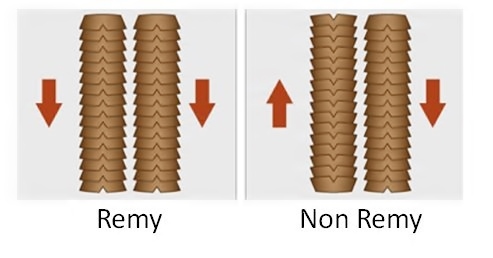 As a significant amount of human hair extensions are not 100% remy (it’s usually a mixture of remy and non-remy), it's possible for many people to come across non-remy weave hair at some point, especially as non-remy weave hair is available in the exact same textures as remy weave hair extensions and if you do, here's how to care for it. If you have sewn-in non-remy hair weave extensions then the care guidance found sew in hair weave can be followed, along with using silicone based styling products to ensure that the hair retains its lustre and sheen. Details about how to care for glue in hair extensions are found in the glue in hair weave care guide. Heavens to murgatroyd! It looks like we've come to the end of the non-remy hair weave road, but there's more information in the Hair Extension Q&A section as well as the navigation menu.